The genome of the frog X. laevis (top) is roughly double that of its relative, X. tropicalis (bottom). There are so many different forms of creationism that it's difficult to find any consistency between any two creationists and even in the same creationist at times. This make it handy for them to move the goalposts around of course because they can always change this or that definition or declare this or that impossible or possible according to the needs of the argument in hand. Mutations are always harmful and can't give rise to new information. New species can't arise by natural processes so have to be created. It must come as a shock then when a scientific paper is published showing both of these to be untrue, and untrue moreover in the same species! A combined Japanese and American team of geneticists have used an analytical algorithm developed by Dr. Oleg Simakov, a postdoctoral scholar in the Molecular Genetics Unit at the Okinawa Institute of Science and Technology Graduate University (OIST), to analyse the genome of the African clawed frog, Xenopus laevis, which is known to be tetraploid (i.e, it has double the 'normal' complement of chromosomes). Tetraploidy is rare in mammals and reptiles but is fairly common in amphibians and fish, as well as many plants. It is believed to arise due to a mistake in meiosis which normally ensure only one of each pair of chromosomes gets into each gamete to make a haploid gamete; instead a gamete gets both pairs and remains diploid like the normal cells. In the rare instance that a diploid sperm fertilizes a diploid egg, the result can be a tetraploid zygote which can grow to become an adult. What the geneticists found was that not only had the African clawed frog undergone this tetraploidy event but that the diploid gametes which fused had come from two related species. In other words, not only had there been duplication of the entire genome in two different species but then a hybridization between these two species had given rise to a new, stable, species with a copy of each of its ancestral species. Their findings are published today, open access, in Nature. 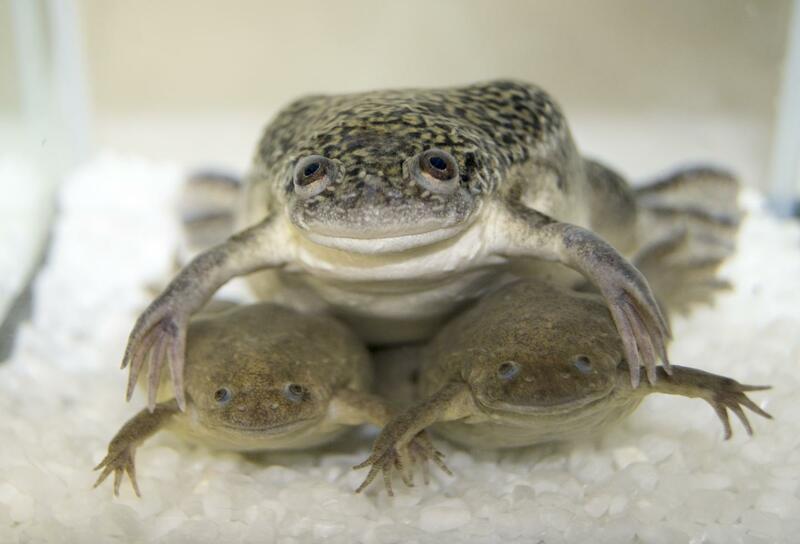 To explore the origins and consequences of tetraploidy in the African clawed frog, we sequenced the Xenopus laevis genome and compared it to the related diploid X. tropicalis genome. We characterize the allotetraploid origin of X. laevis by partitioning its genome into two homoeologous subgenomes, marked by distinct families of ‘fossil’ transposable elements. On the basis of the activity of these elements and the age of hundreds of unitary pseudogenes, we estimate that the two diploid progenitor species diverged around 34 million years ago (Ma) and combined to form an allotetraploid around 17–18 Ma. More than 56% of all genes were retained in two homoeologous copies. Protein function, gene expression, and the amount of conserved flanking sequence all correlate with retention rates. The subgenomes have evolved asymmetrically, with one chromosome set more often preserving the ancestral state and the other experiencing more gene loss, deletion, rearrangement, and reduced gene expression. Session, Adam. M, et al. Genome evolution in the allotetraploid frog Xenopus laevis. © 2016 Macmillan Publishers Limited. All rights reserved. Reprinted under a Creative Commons Attribution 4.0 International (CC BY 4.0) licence. The most exciting finding from our study is that we can partition the current X. laevis genome into two distinct sets of chromosomes, each descended from a unique ancestral species. While plant studies have been able to show similar results using related species still in existence, this study is the first time this has been done with two extinct progenitor species. Dr. Adam Session, co-lead author. To summarise then, about 34 million years ago a species of frog diverged into two distinct species. At some point, due to a whole-genome duplication mutation in each species, a tetraploid form of each arose. Then about 16-17 million years ago, two of these related species hybridized so the offspring had the entire genome of both parent species. This hybrid new species went on to become the modern X. laevis and both parent species went extinct! We now have the fossil genomes of two extinct species of frog recoverable from a single living species. So, the hybrid appears to have been more successful than either of its parent species, and the whole-genome duplication event was not only not deleterious, as creationist dogma says it will always be, but to seems to have conveyed an advantage. This real-word evidence that these two essential pieces of creationist dogma are both wrong will of course not affect the dogmas in the slightest. Creationists will continue to feature them in their reasoning and arguments, and insist that people who know the facts are wrong.